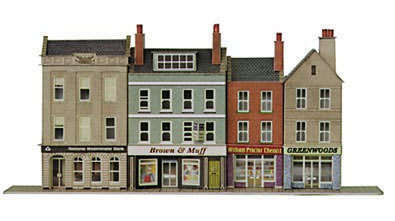 Recommended price £8.50 This kit makes 3 shops and 1 bank which can be used individually or combined to make a street of buildings. Internal detail and flooring is provided. The total footprint of these buildings (190mm x 23mm 7 1/2" x 7/8").